Each fish stool comes with 3 fish, 1 large, 1 medium, and 1 small. This helps to teach size recognition along with colors. Each letter is brightly colored with non-toxic paint and has smooth easy to fit edges. Made in the USA. Available in primary, jewel, or pastel colors, measures 7 3/4" x 16" x 8" to fit most names up to 12 letters. Single name only, for double names please order one of our double name stools. Also available in white. Included is a complimentary gift card. Simply specify during checkout what you would like the card to say. We can also send the message to the recipient via email to let them know that you have ordered a lovely stool for them. To make your stool a keepsake to treasure for years, have that special message engraved on the bottom of the stool for an additional $9.95. Please limit your message up to 6 lines and no more than 30 letters per line. The lettering size may vary according to the length of the message. To see a sample click on the larger image. Free shipping offer does NOT include step stools. Gift wrap not available for this item. These items are custom made and take approx 3 weeks to complete. Each fish step stool comes with 3 fish; 1 large, 1 medium, and 1 small. This helps to teach size recognition along with colors. Each letter is brightly colored with non-toxic paint and has smooth easy to fit edges. Wood name puzzle stool made in the USA. 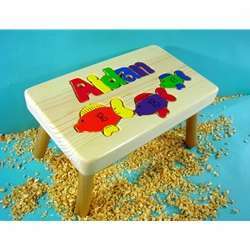 This fish step stool is available in primary, jewel, or pastel colors, measures 7 3/4" x 16" x 8" to fit most names up to 12 letters. Single name only, for double names please order one of our double name stools. Also available in white. Included is a complimentary gift card. Simply specify during checkout what you would like the card to say. We can also send the message to the recipient via email to let them know that you have ordered a lovely wood name puzzle stool for them. To make your fish step stool a keepsake to treasure for years, have that special message engraved on the bottom of the stool for an additional $9.95. Please limit your message up to 6 lines and no more than 30 letters per line. The lettering size may vary according to the length of the message. To see a sample click on the larger image. Free shipping offer does NOT include step stools. Gift wrap not available for this item. Purchased for my nephew. Easy ordering process, shipped when it was supposed to, and looks great! Would definitely buy more. I love the bench and appreciate the over and above effort to get it to me in a timely manner. I'm sad that the spelling is wrong and am hoping that it's fixed this week and that the new letter fits the bench. As well, I'm hoping to see my account reimbursed for shipping charges. I'd be happy to submit another review if all works out in my favor! Today, that remains to be seen! I love the way this adorable/sturdy stool came out. I'm sure my girlfriends grandson will love it for years to come. Dealing with Tiny Keepsakes was a great experience - I'll be shopping here again! Great customer service and my order arrived early - what a treat! I bought this stool for my 2 year old son to help him learn how to spell his name. I was pleasantly surprised when I opened the package and saw the quality of the stool. I love that the legs screw into stool and I don't have to worry about the legs snapping off when my son stands on it to get something out of his reach. The letters and fish are handmade and painted in beautiful jewel tones. And it doesn't hurt that my son can entertain himself for 15-30 minutes playing with the puzzle. Love!